Chef Aaron’s ‘mates, turn up the heat for a family friendly poolside event in Bahía, located on the 7th floor terrace at Four Seasons Hotel Miami. 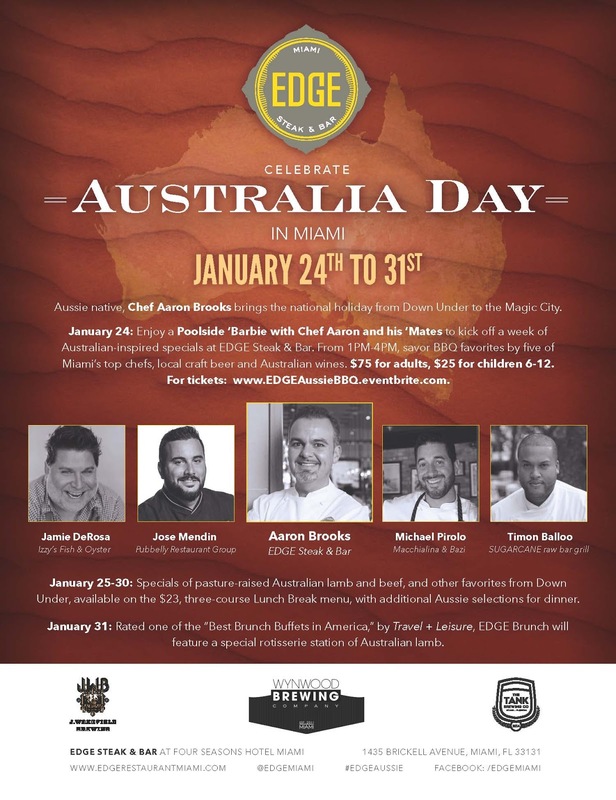 Chefs will be featuring their BBQ favorites, while J Wakefield Brewing, The Tank Brewing Co., and Wynwood Brewing Company pour their local brews. Wines from Australia will also be available. Bring your budgie smugglers, or swimsuits, and enjoy access to the two resort style pools, celebrating winter in true Miami fashion – under the sun. Tickets are $75 per person, $25 for children ages 6-12 and complimentary for those 5 and under. Ticket includes tax and gratuity, unlimited BBQ, select craft beer and wine, and pool access. Tickets must be purchased in advance at www.EDGEAussieBBQ.eventbrite.com. *Note: Eventbrite processing fee will be applied at time of purchase.